These were SO fun to do! Alice in Wonderland is a fun theme for any age!!!! These cute cupcake invites are part of our new invitation line!!! Wizard of Oz, so much FUN!!! McDonalds Cupcakes for TWO cute 2 year olds!!! Bridal Shower Cupcakes designed from her invitation....ooo la la!!! In my life before my amazing twins, I made custom invitations. I LOVED doing this, but it is time and labor intensive, two things that don't mix well with babies. So I put this business on hold and moved on to my other favorite part of the party....CUPCAKES!!! Now that my "babies" are 5 and starting kindergarten in the fall I am itching to get back to invitations! I will be posting pictures of invites I have done in the past, but start thinking about all those parties coming up....graduation, wedding, birthday, summer pool parties, anything and everything you can think of. We can help with the invitations, the favors and the cupcakes! How perfect is that! Let us help you make your next party perfect! 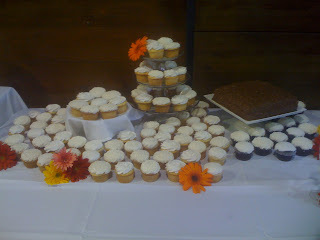 To celebrate "oh cupcakes invites" we are offering a 10% discount on invitation orders placed by July 1, 2010. Call today! Easter is just around the corner! I LOVE Easter! 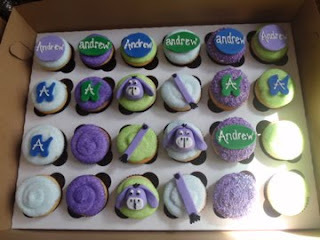 It is my favorite holiday........SO, in celebration of Easter, I am offering an Easter Cupcake Special!! All Easter orders placed before March 26, 2010 will receive a 10% discount off the total. Call today! "Queen of the House" Bridal Shower Cupcakes!! I just created a new oh cupcakes! group on Facebook! Be sure to join! This is a handmade, fondant cupcake topper made for the birthday girl. With Valentines Day right around the corner I thought I would offer a special to all my friends! I am offering boxes of 1 dozen red velvet cupcakes with sugar and sprinkles in red, white and pink for $15 a box! 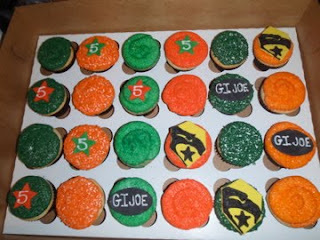 If you are looking for something a little more special you can add 6 themed cupcakes to the box (half plain/half themed) for a total price of $22. Cupcakes are the perfect way to say "I Love You!" Cupcakes make turning any age ok!! Looking for a fun new alternative to a cake? How about a Birthday Box! Boxes include a dozen cupcakes with the birthday boy/girl's age and color preference and a cute bag of balloons and candles! We will even deliver for an additional fee! These were so much fun to make!! Especially the bananas! In a Galaxy Far, Far Away!!! I had so much fun doing these for a friends twins! I apologize for the site going down! 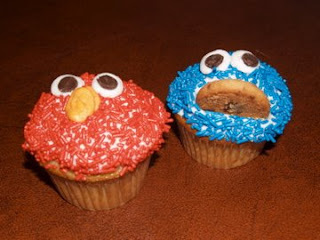 I am currently trying to link my new domain name....ohcupcakes.com with the blog. It is taking longer than I thought to link! Sorry for any inconvenience. oh cupcakes review on Around Town Kids McKinney!!! 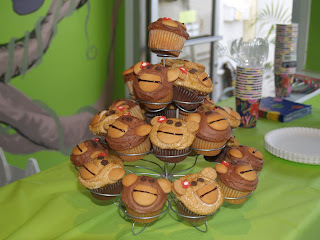 A few months ago Around Town Kids Mckinney Mom on the Go did a review of oh cupcakes! They are re-running it this week. So if you missed it, check it out now! Thanks so much Around Town Kids!!! And don't forget about our coupon on their coupon page!! Thanks to everybody who placed orders during my Back-to-School special! It was a huge success so be sure to look for a new special every month! Hello Cupcake Fans! I have been experimenting with new flavors and designs and I have come up with a Fresh Strawberry Cupcake with Strawberry Cream cheese Frosting!! I taste tested it at a Mothers of Multiples board meeting I had last week and they were a huge hit! It would be perfect for a bridal shower or a baby shower and of course for any little princesses birthday party! The cake is pink and full of fresh strawberries with more fresh strawberries in the frosting! They were so popular I didn't even get to take a picture of them! So be looking for that in the coming weeks! oh cupcakes and Around Town Kids!! 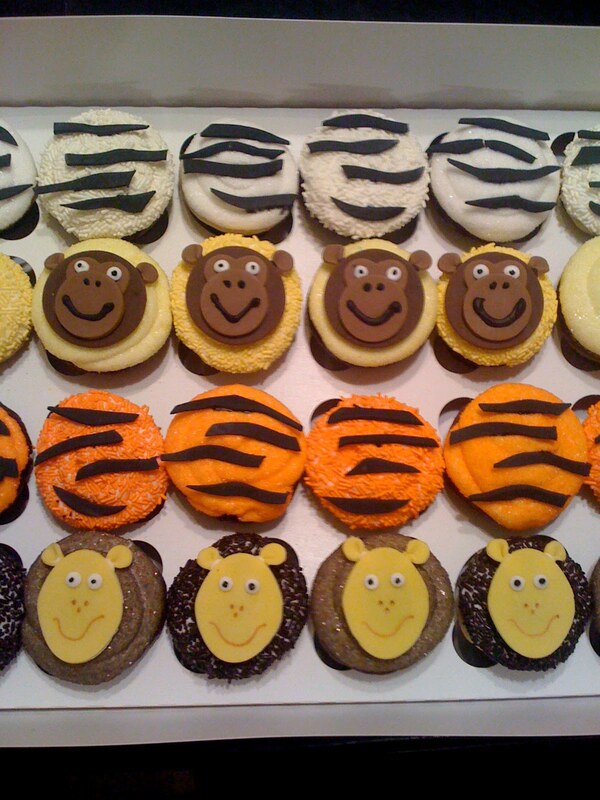 Is there a cupcake you are dying to see? Do you have a sweet idea? 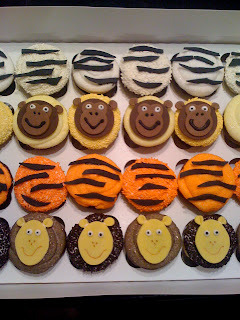 Just e-mail Christi @ ohcupcakes@sbcglobal.net for your custom order today. This is a Flickr badge showing public photos and videos from ohcupcakes. Make your own badge here.